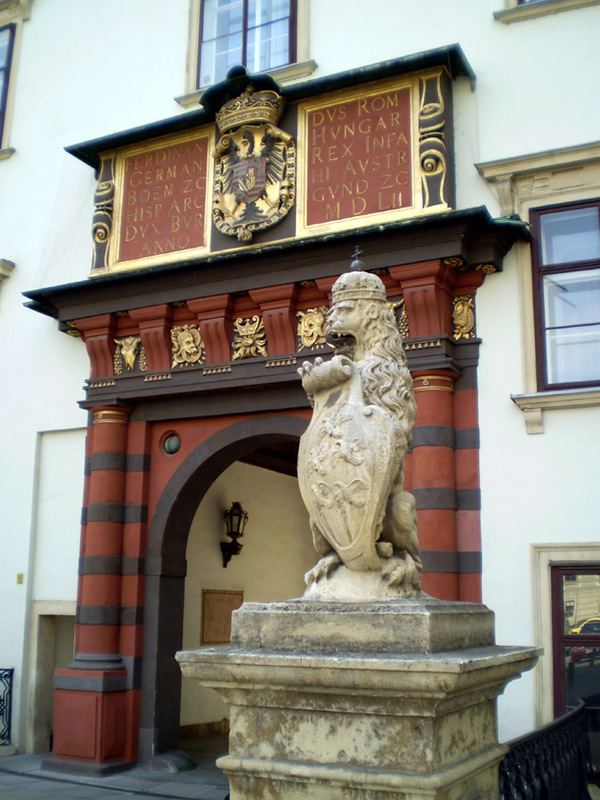 Already a dominant medieval house, the Habsburg Family began solidifying regional power and were ruling the Duchy of Austria by the 13th century. Through careful marriages, they pulled in Burgundy and some German states. Fredrick III, a calculating politician and ruler, was elected the Holy Roman Empire in 1440 which added the Kingdoms of Germany and Italy to the Habsburg holdings. This title dates back to the Emperor Constantine and was the most powerful ruler of continental Europe. Although only a quasi-hereditary position, the Habsburgs retailed control of the Holy Roman Empire (with one exception) and all their other municipalities until the 18th century. Even after that, the Austrian Empire controlled much of Europe until World War I.
I am absolutely fascinated by the Habsburg family. A clan in which each generation was seemingly raised to rule, the House produced some very successful monarchs and interesting individuals. Rather than engage in large-scale warfare, they expanded their empire and consolidated power through skillful and often incestuous marriages. The effect of this royal inbreeding is very obvious in the later generations, especially in the Spanish Habsburg line. Another element of holding on to their power was keeping up the extravagant material standards befitting their political importance. The secular and religious objects of the Austrian Empire are now housed in the Imperial Treasure of Vienna, or the Kaiserliche Schatzkammer Wien. Given these priceless pieces, the Austrian Empire was incredible. The most captivating piece in the collection has got to be the Imperial Crown of the Holy Roman Empire created in the early 11th century. This piece is constructed of eight hinged panels which give it somewhat of a circular shape. The cross piece going from the front to the back gives the crown gravitas as well as structural support. The crown is a rich orange-yellow color because it is made of 22 carat gold. It is adorned with pearls, emeralds, sapphires, amethysts, and other precious gems. The stones are just polished rather than cut which I think gives the crown a rough, ancient feeling and makes the crown even more valuable. The gems are set into the crown with incredibly delicate gold bead work. Four of the panels contain enameled scenes. Below is the King David panel. The banner in his hands reads “HONOR REGIS IVDICIVM DILIGIT” or “The renown king delights in doing justice” (Psalm 99:4). King Solomon is also included in the crown which connects the Holy Roman Emperor to the great Biblical kings. This ancient crown has made several appearances in the coronation paintings of later (and earlier) Holy Roman Emperors. While Charlemagne ruled in the 8th century therefore before the crown was created, Albrecht Durer chose to depict him wearing this regalia in a 1512 portrait of this early Holy Roman Emperor. The Hapsberg Joseph I who ruled as Holy Roman Emperor from 1705 – 1711 is also depicted wearing the ancient crown. While not reproduced perfectly, the Scepter, Orb and Crown on the table may be the Imperial Regalia of Austria shown at the beginning of this article. 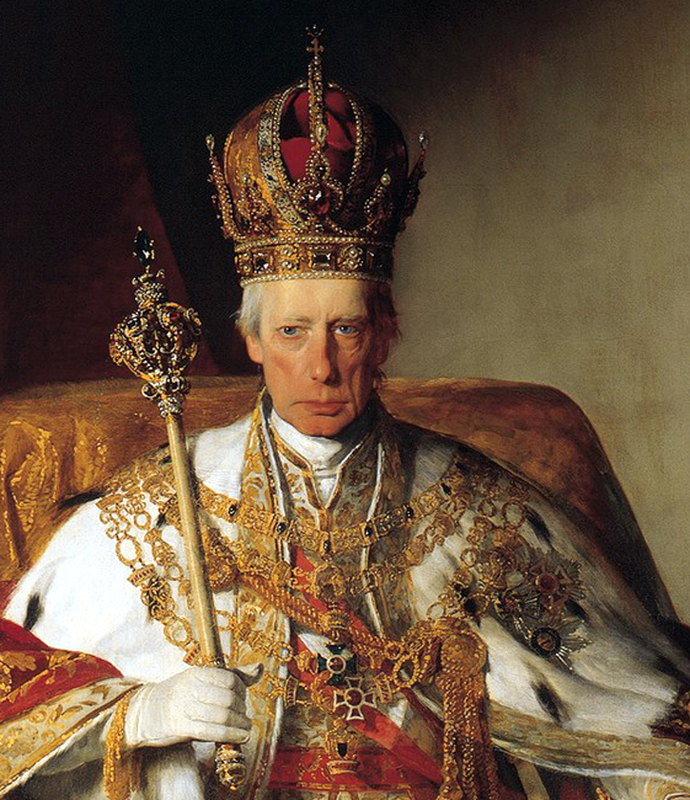 Since the Holy Roman Emperor possessed many other kingdoms, each with their own set of regalia, there have always been numerous crowns in the Imperial Treasury. Medieval society gave rise to chivalric orders which were functionally a public honor given to a loyal knight or lord as well as a social club and advisory team for the ruler. The Habsburgs created and oversaw several orders. Induction usually included a massive jeweled broach or a broad necklace to be worn at formal state events and a smaller piece for daily wear at court. Since cousins and nephews of the ruling line were almost always inducted in a Order or two, the Treasury has beautiful examples of these jewels. For example, the Royal Star of the Hungarian Order of Saint Stephen below is about 4 inches tall and made of diamonds and emeralds. Of course the Treasury also contains exquisite gifts given by contemporary powers to the Austrian rulers. It was a long standing tradition for the Pope to bless a gold rose on the middle Sunday of Lent and give it as a public honor to a deserving person or group. In 1819, Pope Pius VII chose to honor Carolina Augusta, the fourth wife of Emperor Franz I of Austria, with this rose. However, one doesn’t just give a simple rose to the Habsbergs, even if it is gold. 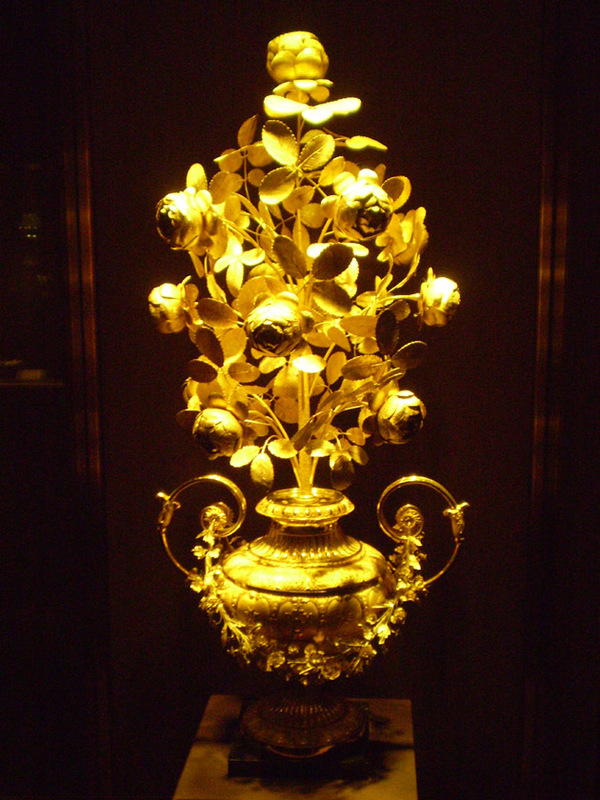 Instead he sent an incredible golden arrangement of 13 roses, symbolizing Christ and the 12 apostles, in an ornate gold vase. Executed with immense detail, all the surfaces of the petals, leaves and stems just glow under the museum lights. I thought this was one of the most beautiful items in the treasury. It was the Holy Roman Emperor after all, so there is an extensive collection of religious objects and bejeweled reliquaries befitting the Saintly objects they hold. One early religious pieces is the Imperial Cross (or Das Reichskreuz). Likely constructed in 1030, the wooden cross is covered in gold and polished gems. The cross was made to hold several relics of Jesus’ crucifixion which have been removed and are displayed next to the cross today. These relics include the Holy Lance which was first mentioned in the 10th century but has been fitted with a Roman nail in the tip which is contemporary to the life of Christ. The other relic was wood from the True Cross which itself was encased in a 13th century holder. Amazingly, this jeweled object was also the Emperor’s “travel cross” and accompanied him on voyages for daily mass. Another beautiful reliquary supposedly contains the crucifixion nail from Jesus’ right hand. The almond-shaped holder held by two golden angels was created in the mid-17th century and made of gold, silver, enameling, emeralds, sapphires, topaz, amethyst, and other precious gems. Legend says that Constantine found this nail and incorporated it into his helmet for the famous Battle of the Milvian Bridge. It was then inherited by the Catholic Church. One of the dark waxy objects tied to the nail inside the glass case is actually the seal of Pope Innocent II (1130-1143) which provides at least some provenance to the relic. The objects also tell us about the deep religious convictions of the House of Habsburg. Empresses Eleanor Gonzaga of Mantua (1630-1686), wife of Holy Roman Emperor Ferdinand III was a cultured Italian who promoted the arts in Vienna but was also a deeply devoted Catholic. She had a broach made from a fragment of the True Cross owned by the Habsburgs. When some of her private rooms caught fire in the Hofburg Palace, she escaped but it was feared that the broach was destroyed. Amazingly she found it completely unharmed amid the charred debris. In honor of this miracle, she founded the “Order of the Starry Cross” as a devotional group exclusively for the highest ranking royal women. These Archduchesses, Countesses, Princesses, and Empresses committed themselves to living a virtuous life, completing acts of charity, and to deep prayer and devotion to the Cross. Eleanor Gonzaga had the monstrance (or relic holder) shown above constructed in 1668 to hold her miraculous wood pieces. This nearly 2 foot tall piece is made of diamonds, garnets, green peridot, silver, gold foil, and other gems and served as the focal point for her daily prayer. It’s a stunningly beautiful piece and amazing to think of this as a personal devotional item. The Imperial Treasury is part of the Hofburg Palace complex in central Vienna. Nearby one can visit the historical royal rooms of the Palace, the Habsburg family tombs, and the famous Spanish Riding School. The Imperial Treasury is operated by the Vienna Art Museum, or Kunsthistorisches Museum, which is also nearby (and excellent). For opening times and tickets, see the Treasury’s website. This gorgeous and fascinating museum can be overlooked in a cit with amazing art and architecture, but it’s definitely a hidden gem… of gems. Entrance to the Imperial Treasury from the courtyard of the Hofburg Palace. As far as history of art is concerned, the Britannica Encyclopedia is a kids comic compared to your blog … 😉 What a great job, Christina! Oh that’s too much praise! Thank you Covetotop! I just couldn’t resist paying attention to all these amazing jewels and had to write about them. 🙂 I loved Vienna and want to go back at some point. I thought you liked Vienna; you had a great post about your music adventures there! I thought the Opera House (Staatsoper) was beautiful and their production of Salome was very good. The set and costumes were in the Art Nouveau style which seems appropriate given the city’s artistic history. No; it is not too much praise! Your blog is a joy to read for art lovers! I would love to visit this place. My kids probably would, too. When we were in Brazil last summer, we saw a lot of gems but from a different perspective…many of the pieces we saw were like “leftovers” of gems taken from Brazil by the Portuguese ruler. This would be a great site for families! The pieces are really well displays and just shine! 🙂 Interesting to think about the places were these gems were found and taken from. I wouldn’t be surprised if there were some Brazilian stones in Vienna.